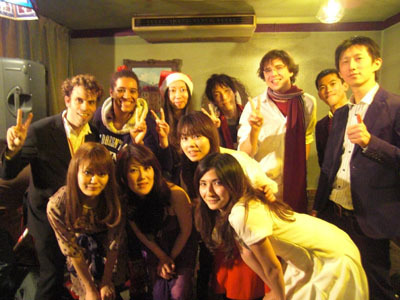 Osakapella is a mixed-voice a cappella group with both Japanese and foreign members. Since the group was founded in June 2001, we have had members from 11different countries! We sing a wide range of songs in both Japanese and English, ranging from 80's hits and J-pop chartbusters to doo-wop, Japanese folk songs, and Christmas carols. With constantly-changing membership and the need to run rehearsals in two languages, the group faces some difficult challenges, but Osakapella has provides a fun place for us to improve our singing skills, work with interesting people from many cultures, experiment with a cappella arrangements, ad lib, and perform!